"In July of 2012, one of my twin five-year-old daughters was diagnosed with ALL (Acute Lymphoblastic Leukemia). It felt like we were drowning. For the first week or so, my wife and I walked around the hospital in a trance. Then I went home and got my guitar. Over the next hospital-bound month, I sang to Clio almost every day. When she felt up to it, she sang with me and we even started to write songs together. Music’s a big part of my life, but I was still amazed by the trans-formative power of what we created together in that hospital room. Music truly can heal. After Clio returned home and cancer treatment became the new normal for my family, I continued to write and collect songs that reflected our experience — the love, the pride, the surprising amount of joy, and some of the struggles too. It was my way of working through what we were facing and of trying to give my daughters the tools to work through it too." These songs are fun loving and easy to share with the entire family. 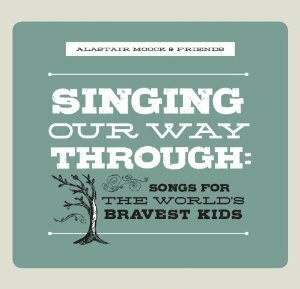 Super set of songs to share with others and to share with your own children and tell them about all of the brave kids in the world. Perhaps you may already know one of these. Song 1 I am the Light is more like a poem using the initials in CANCER to share the desire to overcome the struggle. When I am Bald is a funny look at what you can use your bald head for! Use it for a bird nest. Take a Little Walk with me has Elizabeth Mitchell as well and I really loved the sound of this song. It was beautifully done. B-R-A-V-E is a nice rap song, Joy comes Back sounds like a southern spiritual, and the Classic You've Got a Friend in me is one of my very favorites.